Fox News is scrambling in response to the grass-roots movement to abolish Immigration and Customs Enforcement (ICE), which has begun seeping into mainstream progressive and Democratic politics. 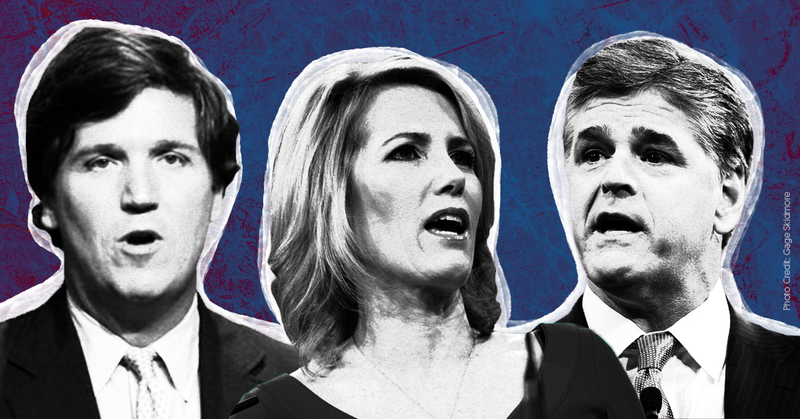 On the evening of June 28, all three of the network’s prime-time shows aired segments attacking the Abolish ICE movement, as did Fox & Friends the next morning. As the Trump administration is stepping up mass deportations, separating families at the U.S.-Mexico border, and interning immigrant children in cages, calls to abolish ICE have spread from a grass-roots Twitter phenomenon to the political mainstream. Multiple candidates for prominent elected positions have endorsed the movement, including New York congressional nominee Alexandria Ocasio-Cortez, a Democratic Socialist who ran on the issue leading up to her upset primary win over Rep. Joe Crowley (D-NY). 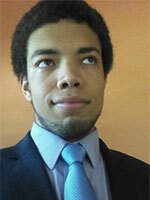 Elected Democrats are also beginning to endorse the movement. In the House, three Democrats support abolishing ICE and a fourth, Rep. Mark Pocan (WI), introduced legislation to abolish ICE and investigate possibilities for “a humane immigration enforcement system.” And in the Senate, Sen. Kirsten Gillibrand (D-NY) endorsed abolishing ICE, and Sen. Kamala Harris (D-CA) said, “We need to probably think about starting from scratch.” Even some ICE agents themselves have called for the agency to be dissolved. Meanwhile, on Fox, the network’s stars were allied in their defense of ICE. After a brief update on the June 28 mass shooting at an Annapolis, MD, newspaper, Tucker Carlson -- who uses his platform to promote white nationalism -- opened his show by denouncing #AbolishICE as an “ideological revolution on the left” and fearmongering about the criminals and drugs that he claimed would flood the country without ICE. Laura Ingraham complained that “Occupy ICE protesters want to, again, make it impossible for our immigration investigators to do their jobs.” And she ridiculed protesters in Washington, D.C., who were calling for abolishment of ICE as “Jiffy Pop” on account of the “tin foil robes” they wore, which were intended to resemble the foil blankets ICE is giving detained children. Fox has long led the media charge to defend ICE and its actions, frequently using the violent gang MS-13 to demonize all immigrants. (ICE also mislabels some immigrants as gang members in order to deport them.) Along with the hosts’ efforts, guests on the network lie and mislead about immigration issues to defend the agency’s critical role in President Donald Trump’s agenda of implementing mass deportations. The Washington Post editorial board compared peaceful protests against members of the administration to anti-abortion violence, which has included multiple bombings and murders. Fox & Friends Weekend host Pete Hegseth said on the show, “It’s so ironic … you’ve got this tolerant leftist running this restaurant” but she refused to serve a Trump official. News reports and experts say the tariffs will hurt Americans in a number of ways. Though the steel and aluminum industries stand to benefit, “almost every US industry” that uses these metals will be faced with higher manufacturing costs, which “will likely get passed on to consumers.” These higher costs could “kill hundreds of thousands of jobs” as companies scramble to offset artificially high prices. Retaliatory tariffs levied by other nations are threatening a wide range of businesses, from agriculture to commercial production. According to The New York Times, even Trump’s own Council of Economic Advisers concluded that the tariffs would hamper economic growth. But media coverage of U.S. allies’ responses to Trump’s economic attack centered on the sensationalism and drama of the moment. 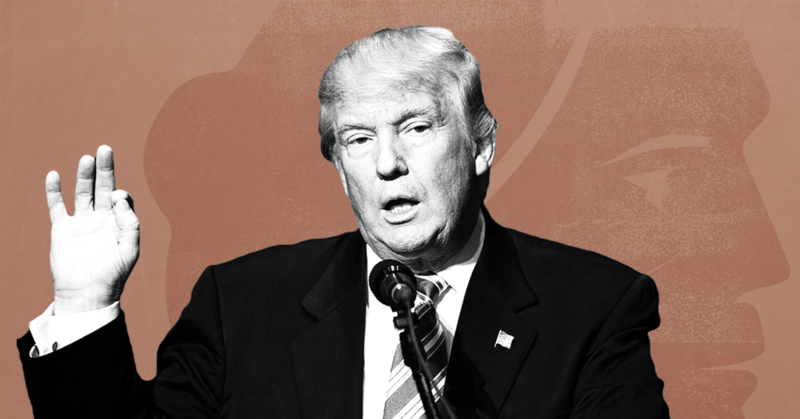 Though CNN interviewed or cited economists in a few segments on the tariffs’ effects for American workers and business, the majority of the punditry focused on the shock value of levying tariffs against U.S. allies. CNN also interviewed Stephen Moore, a Trump campaign economic advisor whom CNN hired as its in-house defender of the president who dodged policy questions to muddy the facts and obsequiously push the Trump agenda (which is how interviews with former or current Trump officials usually go); the network did not interview any workers who could potentially be hurt by the retaliatory tariffs. Much of the coverage on MSNBC also focused on the spectacle and/or provided a superficial analysis of Trump’s actions. But anchors Stephanie Ruhle and Ali Velshi, along with correspondent Vaughn Hillyard, did do substantial reporting on how the tariffs might impact American laborers, coverage which often included the workers themselves, during their combined three hours of hosting time., Velshi and Ruhle dedicated segments to explaining the far-reaching nature of the tariffs from U.S. allies (as well as an earlier round of tariffs from China) and how they might affect laborers and consumers alike. On-site reporting focused on affected farmers, and several reports focused even further on specific industries -- pork products, potatoes, and bourbon among them -- targeted by the tariffs. Ruhle, Velshi, and Hillyard notwithstanding, a common facet of tariff coverage was, as Fox & Friends Weekend co-host Pete Hegseth said, the “unpredictability” of the situation, because it “makes for good TV.” With Friday’s White House announcement of another $50 billion in tariffs against Chinese products, media need to move beyond the drama and focus on the substance and the potential devastation to some Americans. President Donald Trump’s favorite news show, Fox & Friends, is acting as a platform for sycophantic propaganda ahead of Trump’s high-stakes summit with North Korean dictator Kim Jong Un, even as the president enters the talks with little preparation. As other news outlets highlight Trump’s unwillingness to prepare for the summit and critically analyze its possible outcomes, Fox & Friends, which Trump has been known to take advice from, has applauded Trump’s actions toward North Korea without criticism. The hosts also declared that Trump’s detonation of the U.S.-Canadian relationship at the G-7 summit the previous weekend showed that his “unpredictability” can “work to the president’s advantage” in these delicate talks and questioned whether Trump’s fortune and fame might intimidate Kim Jong Un. Watching Fox & Friends, one would think that the summit is already a success story. Co-host Steve Doocy continually floated the idea of a McDonald’s sprouting up in Pyongyang, and Earhardt even asked the CEO of IHOP if the chain might open a restaurant in North Korea. Fox Business’ Charles Payne claimed that “Kim Jong Un’s central planning is not his grandfather’s central planning” (ignoring the current dictator’s horrific record of human rights abuses, which Trump will reportedly opt not to address in the upcoming summit). Today's sycophantic coverage follows months of Fox & Friends' bizarre commentary, dangerous advice, and misguided praise for the Trump administration's North Korea strategy. After President Donald Trump commuted the excessive sentence for a nonviolent, first-time drug offender, Fox News speculated that he could lead an initiative for bipartisan prison reform. In reality, the drug policies enacted by the Trump administration are more likely to worsen mass incarceration. In reality, Trump’s attorney general, Jeff Sessions, has adopted several policies that will actually worsen mass incarceration, especially for the nonviolent, first-time offenders Shimkus was talking about. Even before he was in office, analysts predicted that Trump would grow the federal prison population. Although that population has been decreasing since 2013, the rate of decrease has slowed significantly under the Trump administration. According to Bureau of Prisons statistics, the total number of federal inmates dropped by only around 6,500 in 2017, as opposed to more than 13,500 the year before. Since the current number of federal inmates is already only around 1,500 lower than last year’s total, Trump seems likely to preside over the first growth in federal prison populations in half a decade. Contributing to Trump’s reversal of declining prison populations is his punitive immigration and drug policies. 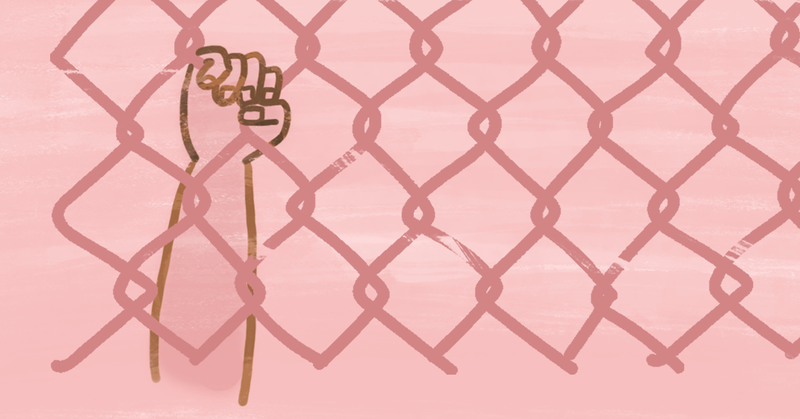 Trump’s Immigrations and Customs Enforcement has made a very high-profile habit of imprisoning immigrants (or people who simply appear to be immigrants) and trying to deport them, including by falsely accusing them of being affiliated with gangs. On drugs, the Trump administration’s extremely regressive policies have flown under the radar and allowed Trump to grab occasional credit for entertaining “prison reform,” even as he and Sessions shovel more people into the maw of mass incarceration. Sessions’ tenure as attorney general makes a mockery of the concept of criminal justice reform; he threatened to prosecute marijuana businesses operating legally under state law and reversed an Obama-era guideline to avoid pursuing charges for first-time nonviolent drug offenders that would trigger mandatory minimum sentences, instructing prosecutors to pursue the most serious charges possible. In addition, Sessions ended an Obama-era program investigating abusive police forces, and his Department of Justice made a months-long attempt to federally prosecute a woman for laughing at him. On Trump’s part, his administration has been an unprecedented boon for the scourge that is private prisons, he has reauthorized police departments to use military surplus gear and weapons, and Trump himself has repeatedly expressed a desire to execute drug dealers. Study finds that Hurricane Maria killed thousands more than the government claims. Media need to do better for Puerto Rico. On May 29, The Washington Post reported on a new Harvard study concluding that “at least 4,645 people died as a result of Hurricane Maria and its devastation across Puerto Rico last year,” which is approximately 72 times higher than the government’s official death toll of 64. According to the Post article, the Harvard study, published in the New England Journal of Medicine, concluded that “health-care disruption for the elderly and the loss of basic utility services for the chronically ill had significant impacts” across the island, including “some communities [that] were entirely cut off for weeks amid road closures and communications failures.” A BuzzFeed write-up of the same study explained that, while at least “4,645 more people died in the final months of 2017” than in previous years, researchers adjusted their estimate up to 5,740 hurricane-related deaths to account for “people who lived alone and died as a result of the storm” and were thus not reported in the study’s survey. If Harvard’s death toll estimate is accurate, Hurricane Maria was the second deadliest hurricane in U.S. history and the deadliest in 117 years. And yet, even as U.S. citizens in Puerto Rico continued to die in 2017, media quickly dropped their focus on the crisis. The first Sunday after the storm, the five major political talk shows cumulatively dedicated less than one minute to coverage. 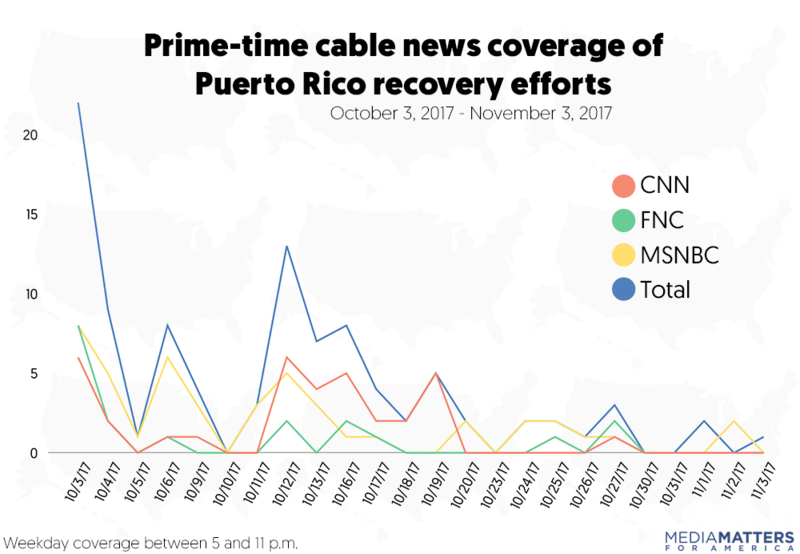 And the overall coverage of the crisis sharply declined after President Donald Trump visited the U.S. territory on October 3; a Media Matters study found that prime-time cable news coverage of Puerto Rico’s recovery plummeted after that date. As the mismanaged recovery continued, media largely talked about the ongoing crisis only when a major scandal was reported, and even then the coverage was negligible and quickly faded. Media should publicize the results of the Harvard study and the woefully inaccurate official death toll, demanding an explanation for how the government hid the magnitude of the casualties. And as the next hurricane season approaches, we need to pay attention to the people who live in Puerto Rico and demand accountability from the government.